You see a pedestrian carrying a white cane crossing the road. What does this mean? You see a pedestrian carrying a white cane crossing the road. What should you do? You see a pedestrian carrying a white cane crossing the road. What should you do? A white cane indicates the person has impaired vision and may not be able to see your vehicle. Certain areas are more likely to have people with impaired vision than others. Local councils install tactile paving (also called detectable warning surfaces, or truncated domes) and other measures to help blind pedestrians cross. Blind people can walk around and cross streets using a guide dog, a human guide, optical and auditory electronic aids, a long white cane or no additional aids. When crossing the street a blind person first has to locate the correct street. They will use traffic sounds, a change in the height of the pavement or kerb, and auditory warnings that beep at crossings. GPS navigation devices can be helpful as they will confirm the actual street. Blind pedestrians tend to develop mental maps of where they are because street level indications of the street name are uncommon. They can also ask other pedestrians. 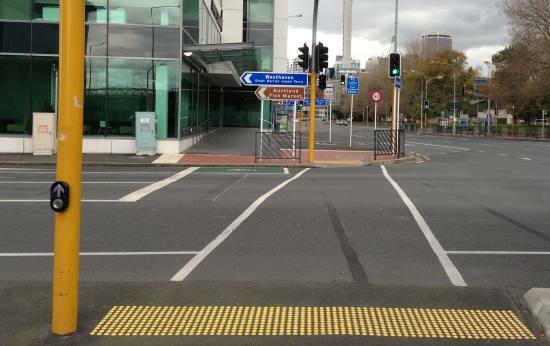 If the intersection is new then blind pedestrians will need to interpret a number of tactile and auditory cues to determine the distance to cross, the direction of crossing, and whether there are islands. Using the sound of vehicles can help a blind pedestrian tell the geometry of an intersection. Most controlled crossings use audible beeps to indicate where the button is, and a separate sound to indicate when it's safe to cross. Pelican crossings don't have these signals and therefore blind people must wait until they are sure that vehicles have stopped. Once they begin to cross, they will attempt to maintain a straight heading through to the opposite side. They will use vehicle sounds and the noise that other pedestrians make to help determine this. Electric vehicles and vehicles with engine cut-off technology which stops the engine when the vehicle is stationary make crossing more difficult. The easiest crossings for visually impaired road users are at a cross roads or t-intersection at right angles where traffic continues to move while the crossing signal is given as moving vehicles give an auditory reference. 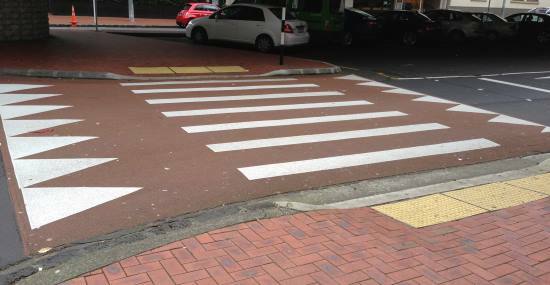 This photo shows a raised pedestrian crossing with tactile paving (in yellow). This image shows tactile paving as separate domes rather than tiles of raised domes. For more information, see The Blind Foundation's website.